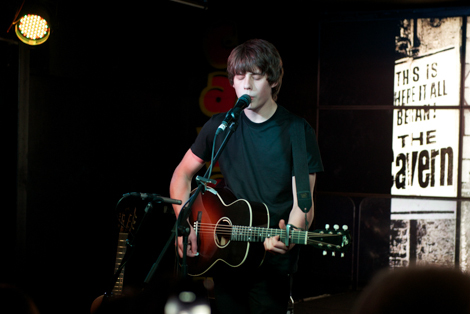 As word got out about Jake Bugg’s secret gig in Liverpool tonight, social media was aflame. Twitter practically went into meltdown, rumours spread like wildfire; where is it taking place? How do you get tickets? Was he playing the Cavern? The iconic Liverpool venue even played their part issuing a statemtent insisting Bugg was not playing at the Beatles’ former residency. The game was up on Thursday morning, with the Cavern revealed and we were off to see the young singer-songwriter in the self proclaimed “most famous club in the world“. Competition winners received their email notifications from this one off event. A long queue awaited us on Mathew Street to collect tickets as around 250 lucky fans crammed into the venue to see Jake’s secret show. Opening with Trouble Town it quickly became apparent their was no planned set list. Cue the inevitable madness of people requesting songs constantly, but such was the feel of the evening. Playing in the home of the Beatles it would have been rude not to play a cover. So it was no surprise when we were treated to Norwegian Wood. An unexpected yet wonderful cover of Johnny Cash’s Folsom Prison Blues following shortly after was equally impressive. Jake managed to cram several songs from his number one album into the set including Fire, Seen It All, Two Fingers and Simple As This. However, the highlight has to be the wonderfully delivered Broken; further evidence that this young lad from Nottingham is going places. Interacting with the crowd throughout the set and taking requests at this unique gig. So unique that the majority of the crowd recorded it on their mobile phones. A sea of smart phones in the audience was a constant and bizarre sight. Finishing on the ubiquitous hit Lightning Bolt, Jake provided a great sing-along for the fanatic crowd before dashing off to his gig in Manchester as the next stop on his European tour. 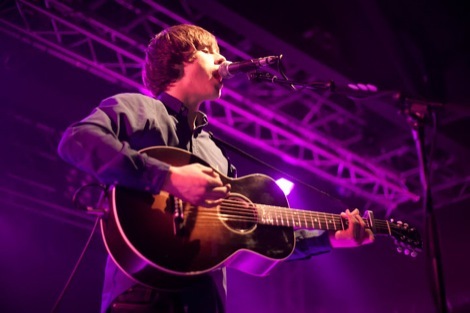 Walking on-stage to the sound of The Charlatans and leaving to the late Lou Reed, Jake Bugg has managed to mix old and new music beautifully. In an era full of smart phones, X Factor and ticket touts – a secret gig in an iconic venue listening to a modern ‘star’ play classics feels like the good old days.